I’m ecstatic. 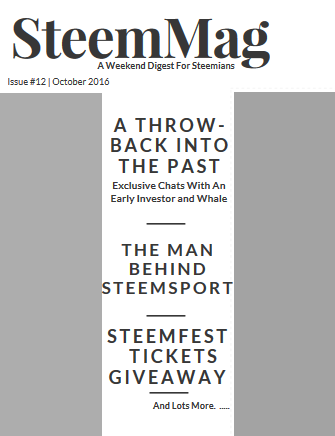 It is with great pleasure that I welcome you guys to the twelfth edition of SteemMag, a weekend digest for Steemians. This weekend’s issue is a special one has it marks the 3rd month of running SteemMag.. And its been an exciting journey so far..
SteemMag reached out to @smooth, the first ever Steemian to be interviewed on SteemMag. He is an early whale, investor , a top witness and a cool nice guy to be with. SteemMag had a chat with @thecrytptodrive, the Man behind SteemSports, a wonderful initiative that’s fun and aims to redistribute SP to participating Steemians. You are one of the earliest Steemains joining over 5 months ago. How has the journey been so far? There have been obviously huge ups and downs, not only in terms of the price of STEEM (and I do come at this primarily from the perspective of an investor) but waves of new users and bloggers, the mega payout, the hack, etc. You mentioned this 3 months ago on SteemMag #1… Which path do you think Steemit is currently heading to? Interestingly, both. As a cryptocurrency and blockchain platform, it has established itself in the top 10 (currently #8 on coinmarketcap). And likewise, as cryptocurrency projects go, the user base is a respectable size, and that was achieved very quickly. Yet, at the same time, active user growth has slowed to a trickle at best following the post-July 4 surge, and it doesn’t seem that on its current path Steem will necessarily be all that well known beyond its current audience by the end of the year. As a social media platform the user base is minuscule. Those of us who have brought people to the platform have found that most of them have not stuck with it, which hints at some of the problems holding back growth. Unless something major changes to bring more users, investors, and attention I do unfortunately see Steem stagnating and even declining. What's been your most exciting moment on Steemit so far? Clearly the July 4 mega payout. It was at that moment (and over the following days and weeks as people figure out how to “cash out”) that Steemit became “real” to users who had signed up and seen themselves being rewarded for their contributions with numbers on the screen but had no way to access those funds. There have been several changes on Steemit over the months. Which has been your (a)favorite and (b) least favorite change on Steemit? My favorite change in Steemit is the “Feed” feature (including the new “Resteem”), which has really changed how people interact with the platform and discover content. My least favorite have been the various economic changes which have been proposed and in at least one case implemented. I feel the approach that has been taken (especially cutting Curation Rewards from 50% to 25% of the reward pool) have led to making Steem a less attractive and more dangerous investment and contributed to declining investor interest, along with a number of other problems that are more complicated to explain. You've been in the cryptocurrency space for quite a while, what do you see elsewhere that you would like to see on Steemit? More privacy. The Steem blockchain is among the least private with coin holdings and transactions not only on a public ledger but directly tied to a visible social-media identity, and easily visible on a web site. Other privacy-focused projects such as Monero (where I’m directly involved) and Zcash have generated a lot of excitement in the cryptocurrency world over the past year and this is something Steem is sorely lacking. Private transactions are on the Steem roadmap but there hasn’t been any visible progress toward actually implementing anything. I do not like how the flagging/hiding feature works at all. I would prefer to see individual users have more control over who and what they want to hide, rather than enforcing these features globally as is the case now (which can indeed be seen as a form of censorship). This is an experiment I’ve considered doing. Specifically to sign up using an unknown “minnow” account and try to build up my SP. Not particularly enjoying writing or blogging is the biggest obstacle, as long as those are the primary ways to earn on the site. Perhaps that is just saving me a lot of frustration though. The minnow’s life on Steemit is not easy! Steem price is currently at $0.5. It shot from $0.025 when we first had a chat to over $4 last 2 months.. Do you think it can reach that height again and even GO higher? It certainly can, but it requires either a turnaround of user growth toward much higher levels on the social media platform, or some sort of “pivot” that allows the blockchain to thrive in some other manner despite the social media aspect stagnating. Possibilities of latter that have already been discussed are smart contracts side chains and a decentralized marketplace. I’m sure there are others. There are also a number of independent developments to approach social media from a different angle, such as Busy and SteemQ, that have a lot of potential and I’m really excited to be supporting. Any last thought/ message to Steemians? Invite your friends, which is the same comment I made during the first interview. However, this time I would say to invite your friends to bring new ideas about how Steemit can break out of its current fairly-limited model. Steemians Speak - Where do you Steemit at the end of the year? I think Steem will be in a very healthy position. Lots of new features on Steemit. Lots of new apps. Lots of great content. As for the price. High inflation will dictate that the price continues to decrease IMO. ~ @steemitblog announces Graphene 2.0 , the underlying technology that powers the blockchain. ~ Steem maintains last week’s 8th position on the coinmarketcap.com’s crypto market capitalization list. ~ @ricardoguthrie’s Yaadio, a niche online store for handmade jewelry forges a partnership with Peerhub. ~$0.45 and $0.5 were the lowest and highest value traded this week for a unit of Steem respectively. The minnow’s life on Steemit is not easy! Very interesting. I think @smooth makes some very valid points. I hope he is wrong about the growth though we will have to see. Love your mag and really appreciate all that you do for the Steemit Community. Great to see your mag gets recognition. I wish you continued success and thank you for making Steemit a more successful community! Glad to see you drop by again.. Have a good one.. I am grateful you appreciate it! I don't have a negative outlook overall. There is still a huge opportunity here. In fact I just powered up >20K STEEM in addition to spending thousands of SBD per week to support the projects and initiatives that help develop the platform and community, giving us the best chance to break out of the current rut. Despite the huge opportunity I do see a lot of issues, challenges, mistakes, and risks and I'm not one to gloss over it. There are enough cheerleaders in crypto, we don't need another one. yes, the cheerleaders are numerous, so you being 70% negative about steemit is a means of providing balance for all those cheering, which could be a strategy for success. After my first few weeks on steemit of reading your comments I had to stop reading them, as your words make me feel like investing in steemit is a huge mistake and waste of my time. Really? Ive been on Steemit before July 4 and @smooth has been the most engaging whale on Steemit. Go check his wall page .. If you are that early, you should remember his "slack era" numerous projects too..
More importantly, you cant just throw baseless accussations based on what you think.. Have some standards man..
Resteemed and tweeted for exposure! Oooo, I've been posting about ways to break out of our fairly limited model for a couple of days now, for example by attracting people from webcomics industry, or maybe crossing Steem Blockchain and Soundcloud API. Problem is my coding skills are waaaay to rusty, and since I am away from any viable computer there is no easy way to brush up on them.